This page shows some pictures of past models and improvements over the years, with our newest model shown at the bottom. As described on the patent page, our first custom prototype model was a five-foot diameter version in 1985 (top left). It had clear acrylic launch ramps and a carpet-covered round base. With a few production differences, this is the model that has been preferred by museums, zoos, and shopping malls. We have included pictures in the "Compare" section below of various versions of this design with accompanying descriptions of some of the disadvantages that have been overcome with our new patented models. Our Three Foot diameter models are the most popular size since they fit into the available floor space of stores and restaurants, so there are lots more of them throughout the world. 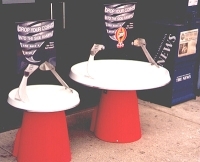 Two-Footers are primarily placed in fast-food restaurants and other small floor-space locations. Our new giant Seven-Footers...the largest production coin funnels on earth with EIGHT launch ramps are designed for shopping malls, museums, zoos, aquariums, planetariums, airports, and coliseums, stadiums, and other large floor-space areas. Our new proprietary design with the ramps mounted OUTSIDE the circumference allows the coins to roll on the ENTIRE surface of the funnel without having to be launched on a path so they miss the ramp on the opposite side like all the older models. It is like getting a much larger Well in the same amount of floor space as the older models. Of course, our Seven-Footer is even more spectacular and includes EIGHT COIN LAUNCH RAMPS mounted outside the funnel! 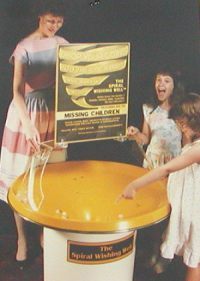 So 8 people can play at a time which attracts a lot more money, and the coins use the entire funnel surface for a lot bigger show with more revolutions. All this, and the footprint is no larger than the old model five-footers. How is that possible? Because the ramp-mounting surfaces are in the "corners" of the Seven-Footer, they do not increase the side-to-side width of the Well. Said another way, when we place the funnel into a box, the ramp-mounting surfaces occupy the otherwise unused "corners" which means they do not increase the foot print floor width, or the dimensional shipping rates! The result of all the features of our new Seven-Footers is that they will generate more money in the first year than our old models, or any copies, over and above their cost! Click here to review our patents if you haven't already seen them. This page also compares features, performance, and income to some of the unauthorized copies that have come and gone over the years. Over the years, unauthorized copies have popped up from time to time. They have all had in common the old original style where two ramps are mounted INSIDE the perimeter of the funnel as you can see in this five-footer picture of our first Well. We don't want you to get caught up in the middle of any controversy or action that might come from getting one of these unauthorized copies. But in addition to the patent rights, we are proud that our Wells are the very best in workmanship, performance, and income generation. 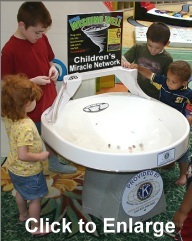 This design is too tall for children, and because the base is the same size as the funnel, it creates a hazard when children try to stand on it. 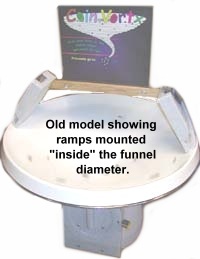 The width of the rim and the fact that the 2 coin ramps are mounted "inside" the funnel effectively turns it from the advertised 5-foot size down to something closer to our Three-Footer size. 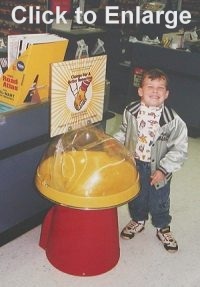 There are 2 things we don't have any control over: a) The size of coins, and b) The size of children! So our Wells are designed to accept coins from all currencies in the world, and are low enough so small children can reach the launch ramps and see down into the funnel without the need to crawl on top of it. Square box designs use a large wooden case, have wide fiberglass lips, and the ramps are mounted inside the perimeter. So their 5-foot outside diameter (and even larger box) is effectively much smaller, especially with the ramps mounted inside the perimeter. The effective coin-rolling surface is very close to our Three-Footers, but it takes up much more floor space...the most valuable commodity that stores have. So these large box-style units are more difficult to place. 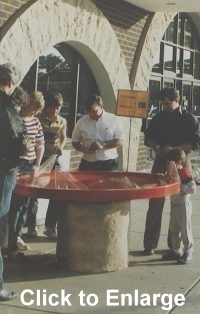 Our first production model was a "Three-Footer", referring to the diameter (91.4cm). 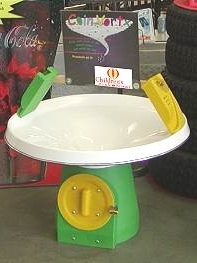 The ramps were "single coin at a time" plastic slots and the base was a modified Rubbermaid trash can! Our design and materials have come a long way since then. 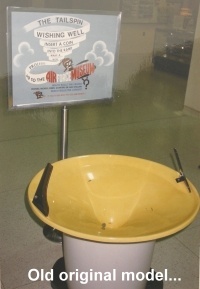 Nevertheless, the Well in this picture raised over $200,000 in the Dayton Air Force Museum before it was upgraded to a newer model. They have since topped over $2 million! 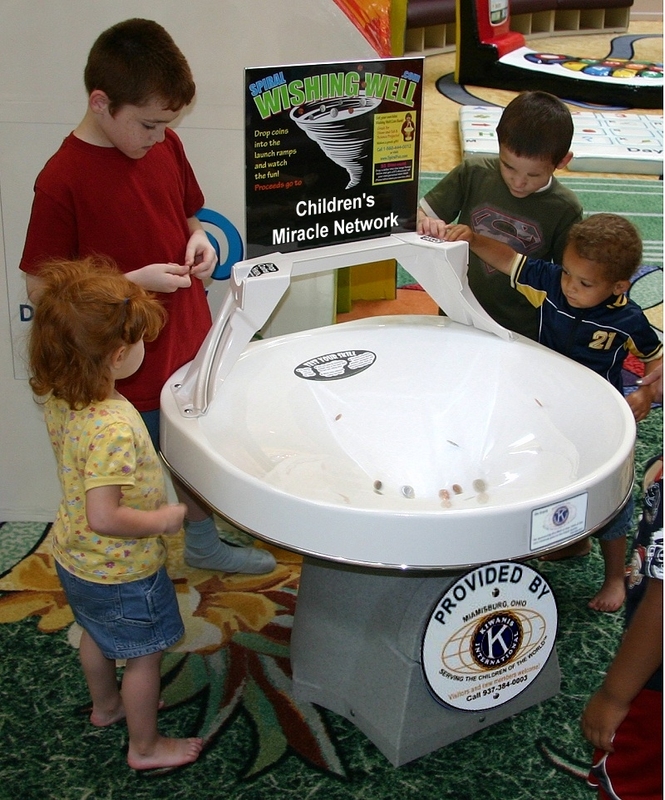 This is a picture of our first improvement with wide-mouth "Drop Coins Here" areas that allowed several coins to be dropped at once, and that made it easier for young children to play. Click here to enlarge this picture. The ramps were connected by a bridge and sign frame. The clear acrylic material was beautiful, but prone to breakage from rough use. The base was still a modified Rubbermaid trash can. As described previously, notice that all these older models had in common that the launch ramps were mounted INSIDE the funnel diameter. That means the coins had to be launched on a path that missed the ramp on the other side. As you will see in the new model shown at the bottom of this page, the ramps are now OUTSIDE the funnel and the coins are launched on a full-circumference path for more spinning time and a greater show with a smaller footprint. 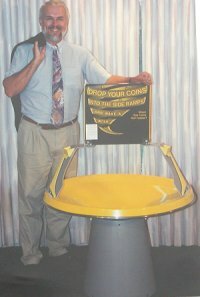 Our next major model change included more durable PVC launch ramps and a custom rotationally-molded base, shown here with Steve Divnick, the inventor and President of the company. The PVC Ramps were more durable than the acrylic and allowed different colors. Click here to enlarge this picture. A clear dome: Good idea? Or bad idea? 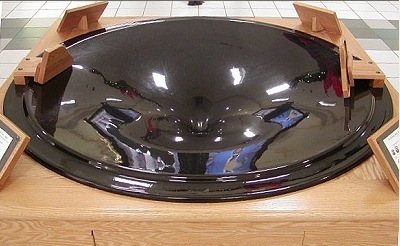 We added a Two-Foot diameter model in the late 1980's with a clear dome with the launch ramps molded into the dome. We thought it was a great idea...everyone agreed...and we planned on adding it to the Three-Footer. A dome seems like it would be a good design because it keeps people from tossing trash into the Well and prevents them from grabbing the coins before they spiral all the way down into the base. Click here to enlarge this picture. But we quickly discovered some significant disadvantages. Based on popular demand, after a few months, we changed back to the more durable open ramp configuration which is also more profitable since it allows interaction. Click here to read more reasons why an open style is better. The next model featured stainless steel metal launch ramps which were made with a new laser technology which served very well for several years. The next model featured rotationally-molded launch ramps in various bright colors. The ramps were connected by a hard-wood bridge. While these materials were virtually indestructible, and they allowed a variety of bright colors, the ramps had a "boxy" look. The launch ramps are mounted OUTSIDE the funnel surface which yields more spinning area in the same size foot-print. The ramps are mounted toward the BACK where they don't block the view of the funnel. The materials are automotive quality for a more professional look and durability. They have a smooth underside to eliminate any sharp fiberglass hairs that older production methods had. The coins perform much better with wider spirals and a longer show. Funnels are available in many colors. The new Seven Footer has eight molded-in coin ramps, all mounted OUTSIDE the funnel for maximum coin-path diameter. The play value is exceptional. NEW MODELS ARE MORE PROFITABLE! Not only are the new designs more professional and durable than past models, they are also more profitable! This is especially true with the Seven-Footer compared to all past variations of the Five-Footers. In fact, we offer a guarantee to the hundreds of museums and zoos around the world who have the old 5-foot models: Even though your existing 5-footer is already paid for, you will raise more money in the first year with a new Seven-Footer, over and above its cost! Therefore, if you are thinking of getting a large Well for the first time, even if you could get one of the old designs free, it wouldn't raise as much money as the new Seven-Footer, over and above its cost, in the first year alone! And of course, nothing compares to the durability of molded-in launch ramps and the professional automotive-quality of our Wells. So it is an investment you can be proud of, and confident that it will generate the most money possible for your fund raising needs. Looked at another way, if you have a good location for a Well, you want to maximize its return. That location is the "gold mine". You don't want to go after the gold with an old pick and shovel when you can do it with a modern giant machine. Similarly, we don't think it makes any sense to place an old funnel that will generate far less income, even if it costs less initially. Your goal is to get as much out of that floor space as possible...to get as many people as possible to empty their purses and pockets. Clearly, it is easier to do that when 8 people can play at a time...not only generating more income, but generating more attention which draws more people over to see what the excitement is all about. As the company that invented fund raising coin funnels, it has been our privilege to participate in helping charities, organizations, and stores raise funds all over the world. We are very proud of our innovative designs, quality, service, timing, and communication.